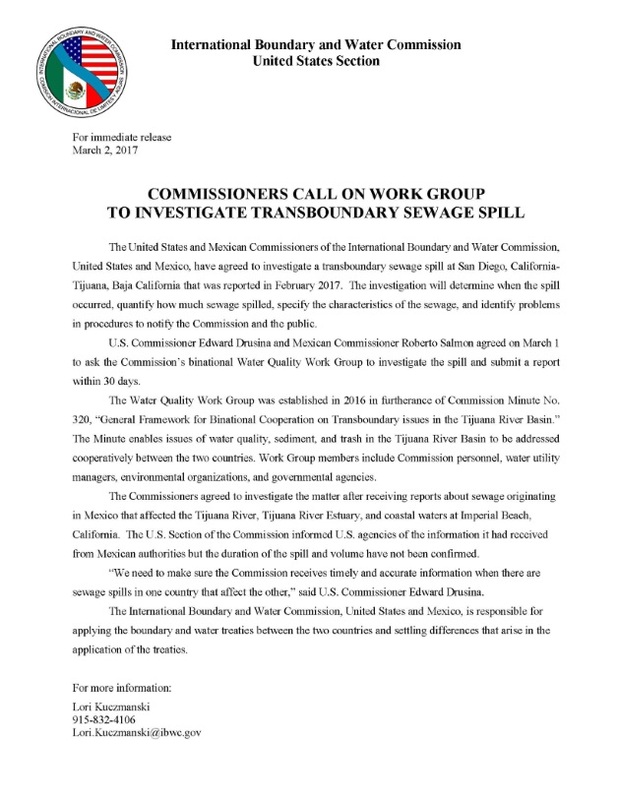 The United States and Mexican Commissioners of the International Boundary and Water Commission, United States and Mexico, have agreed to investigate a transboundary sewage spill at San Diego, California-Tijuana, Baja California that was reported in February 2017. The investigation will determine when the spill occurred, quantify how much sewage spilled, specify the characteristics of the sewage, and identify problems in procedures to notify the Commission and the public. U.S. Commissioner Edward Drusina and Mexican Commissioner Roberto Salmon agreed on March 1 to ask the Commission’s binational Water Quality Work Group to investigate the spill and submit a report within 30 days. The Water Quality Work Group was established in 2016 in furtherance of Commission Minute No. 320, “General Framework for Binational Cooperation on Transboundary issues in the Tijuana River Basin.” The Minute enables issues of water quality, sediment, and trash in the Tijuana River Basin to be addressed cooperatively between the two countries. Work Group members include Commission personnel, water utility managers, environmental organizations, and governmental agencies. The Commissioners agreed to investigate the matter after receiving reports about sewage originating in Mexico that affected the Tijuana River, Tijuana River Estuary, and coastal waters at Imperial Beach, California. The U.S. Section of the Commission informed U.S. agencies of the information it had received from Mexican authorities but the duration of the spill and volume have not been confirmed. “We need to make sure the Commission receives timely and accurate information when there are sewage spills in one country that affect the other,” said U.S. Commissioner Edward Drusina. The International Boundary and Water Commission, United States and Mexico, is responsible for applying the boundary and water treaties between the two countries and settling differences that arise in the application of the treaties.